A narrow canyon north of the fortress of Horkania, with remains of a Byzantine monastery, water reservoirs, and two ancient mysterious tunnels. 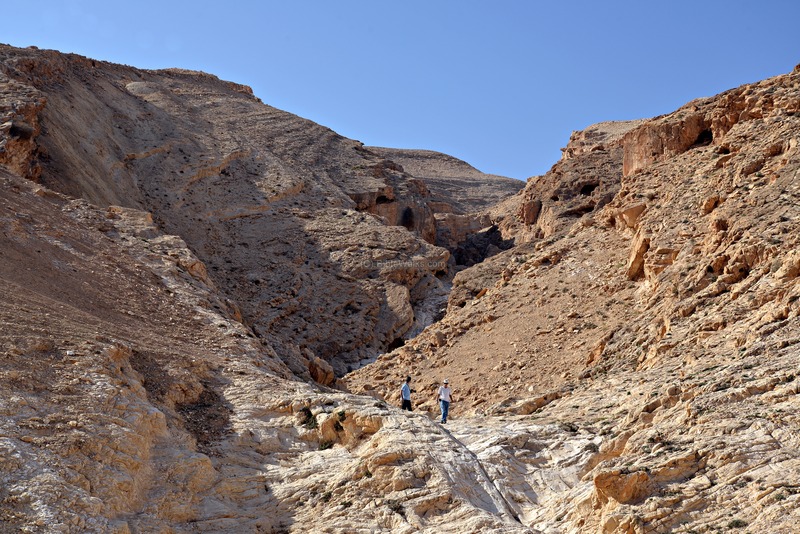 Nahal Sekhakha (Secacah stream), or Wadi Abu Shu‘la, is a narrow canyon located to the north of the fortress of Horkania, and is one of the sources of Qumran brook. Along it are remains of a Byzantine monastery, water reservoirs, and two mysterious ancient tunnels. The site is mentioned as one or more of of the hiding places indicated by the copper scroll. 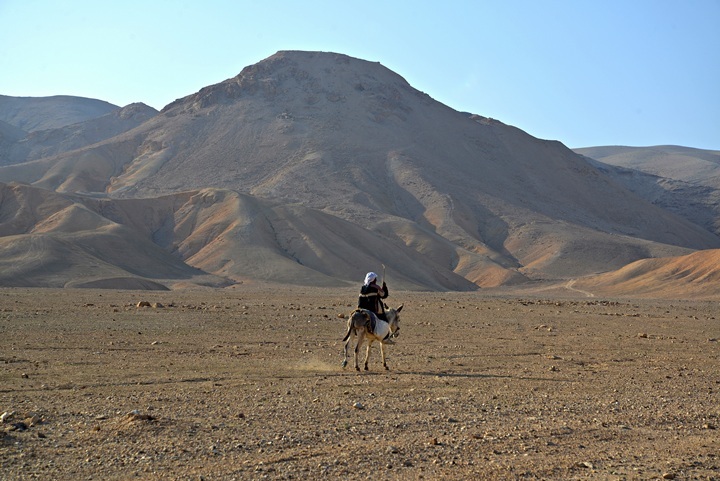 Nahal Sekhakha is located in the Judean desert, 16 KM east-south-east of Jerusalem, and north of the Horkania fortress. It flows to the valley of Horkania, and then continues as the Qumran brook. Sekhakha was an ancient city, referred in the Bible as one of the cities of the tribe of Judah (Joshua 15 20, 61): "This is the inheritance of the tribe of the children of Judah according to their families... In the wilderness, Betharabah, Middin, and Secacah". There are several suggestions for the identification of Sekhakha. One of them is Qumran. 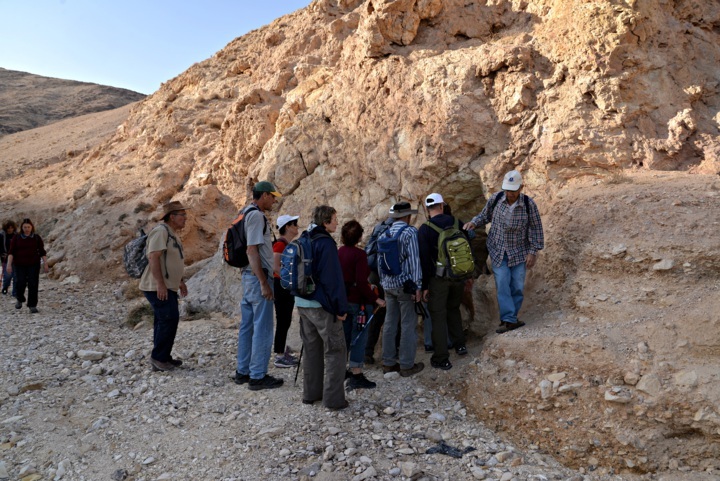 Another candidate is the ruins of Khirbet Samra, an Iron Age site which is located along Nahal Sekhakha in the center of the plains known as the valley of Horkania. 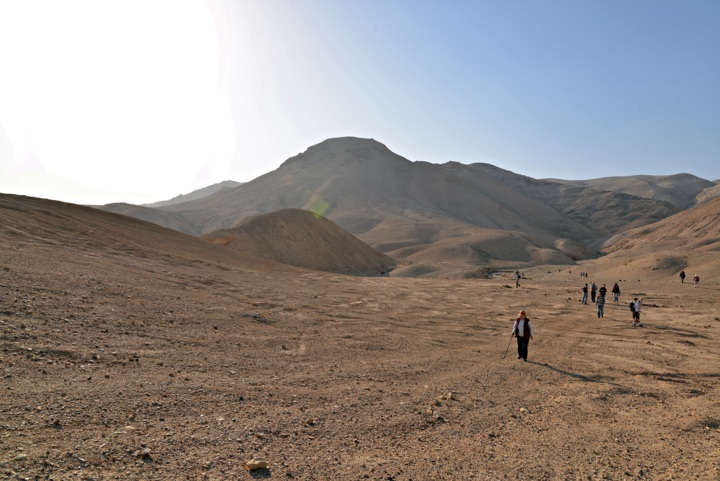 Sekhakha is also a landmark mentioned in the copper scroll (numbered #3Q15), which lists a collection of treasures buried in the desert during the Hasmonean or Early Roman period. Two stepped tunnels were found on the eastern section of the canyon. They were thoroughly excavated and were dated to the Iron Age II or the Hasmonean period. At this time their purpose is not known - see details in the photo section. Starting in the end of the 4th C AD, monks started to populate the caves of the Judean desert. The Byzantine monks came to the Judean desert to seek the simplicity, purification and the solitude of the desert. Ruins of a Byzantine monastery were found on the upper section of Nahal Sekhakha. The monastery, named "Spelaion" or the "Monastery of the cave", was founded by Sabas (439-532), one of the most important figures of the desert monasticism. Sabas founded the monastery with his companion monk Paulus, one of 13 desert monasteries he and his disciples established. The Spelaion was located at a short distance west of the Castellion on Horkania, and 6km north-east of the large Laura of Mar Saba. It was constructed around a cave on the northern slope of the valley. Sabas retired here to the cave from time to time. The monastery was founded in 508 AD, after the cave was transformed to a chapel, the monastery was constructed on its slope, and a wall surrounded it. This was a form called "Coenobium" (pronounced Coi-Noi-Bee-Yum), which was a communal monastery, where a number of structures were surrounded by a wall and the monks lived there in a commune. This word is based on the Greek words Koinos (common) and Bios (Life). The monks lodged inside the compound and also in the caves around it. 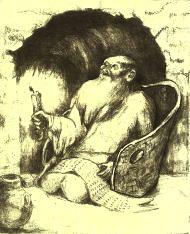 The emphasis of this form is the community life, in contrast with the solitary living of the hermits which was too lonely and often led to mental breakdown. The archaeological survey was headed by Prof. Joseph Patrich, who also published a book on the subject. They identified a dining hall where the monks assembled once a week. Sections of a mosaic floor were found there, as well as bases of structures and walls. Conder and Kitchener surveyed this area during the Survey of Western Palestine in 1873. They reported on their account of the area of Horkania and Nahal Sekhakha, known in Arabic as Wadi Abu Shualeh (SWP, Vol 3, p 213). We have added comments in italic. Bir Abu Shualeh - "a well with water-troughs close to a large cavern cut in the rock north of the well, and resembling Mugharet Umm el Hummam". 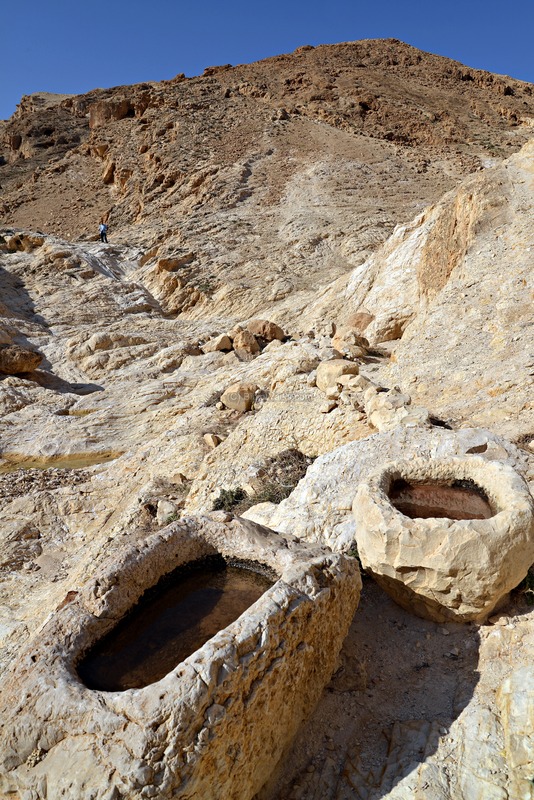 (Biblewalks: these pools are described in this page; supplied water to the cave monastery). Bir el Katar (Biblewalks: a well above the monastery. Arabic name for "well of drops"). Khurbet es Sumrah - "Scattered stones and terrace walls, said to be remains of vineyards by the Arabs". 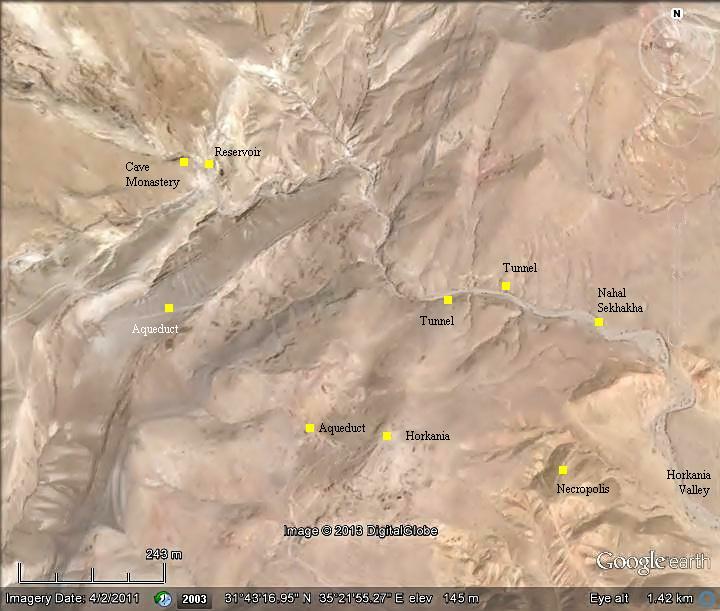 (Biblewalks: this site is located to the east of this section, and is now identified as ancient Sekhakha. See its page for further info). Aqueduct (Biblewalks: a section of the aqueduct to Horkania started from a dam on the upper section of Nahal Sekhakha; see Horkania). The monastery was surveyed in 1981-1982 and a limited archaeological excavation was conducted in 1983 (headed by Prof. Joseph Patrich). 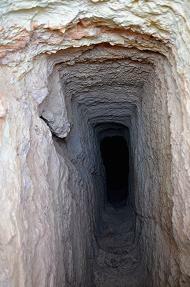 The tunnels were excavated in years 2000-2008, headed by Oren Gutfeld. The copper scroll (number 3Q15) was found in cave 3 in the the area of Qumran, and was made of two separate sheets of copper. It is dated to the 1st C AD, which is later than all other Dead Sea scrolls found in Qumran. Since the sheets were found rolled up together, they had to be cut into 23 parallel strips. This mysterious scroll, with 12 columns, provides instructions of immense treasures and mentions 64 treasure locations of Gold and Silver. Most of the locations cannot be identified, so this ancient "treasure map" is challenging. Here are the treasures that may have referred to the area of Horkania ("Achor?") and Sekhakha ("Sekaka"). "In the ruin of Horebbah which is in the valley of Achor, under the steps heading eastward about forty feet: lies a chest of silver that weighs seventeen talents". "Dig down three cubits in the middle of the two boulders in the Valley of Achor, and you will find two pots full of silver coins". "Dig for only one cubit into the memorial mound of stones in the valley of Sekaka to find twelve talents of silver". "A water conduit is located on the northern side of Sekaka. Dig down three cubits under the large stone at the head of this water conduit to discover seven talents of silver. 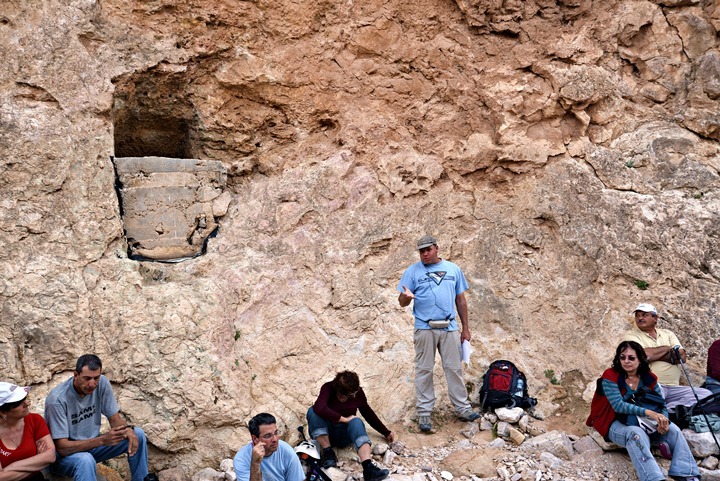 Vessels of offering can be found in the fissure of Sekaka, which is on the eastern side of the reservoir of Solomon". According to some scholars, the ruin ("Horebbah") is the fortress of Horkania, and the "valley of Achor" is the valley of Horkania. So treasure hunters and expeditions are trying to find them in the past 50 years. 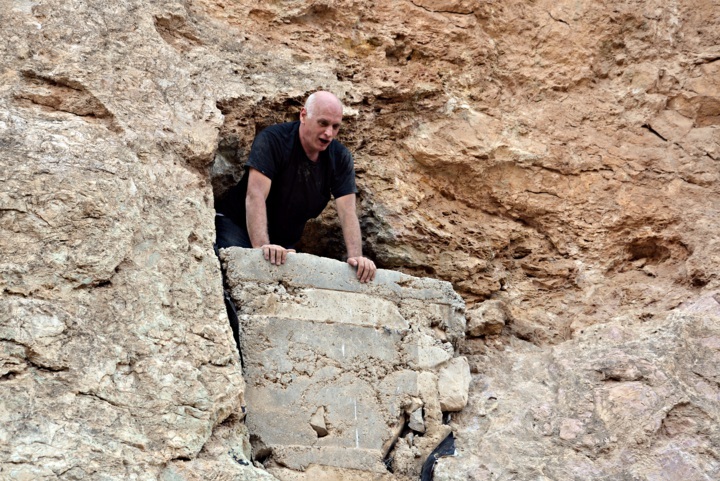 Attempts were made to find them in the stepped tunnels in Nahal Sekhakha or in the tombs on the south side of the valley. Are these treasures for real? Have they been found already? We have no answer to this mystery, and perhaps in the future some of the treasures will be found. In the mean time, let's tour the area and enjoy the views. The east side of Nahal Sekhakha is wide. It opens up to the valley of Horkania (Hyrcania). In the center of the far background is the fortress of Horkania on top of the hill. 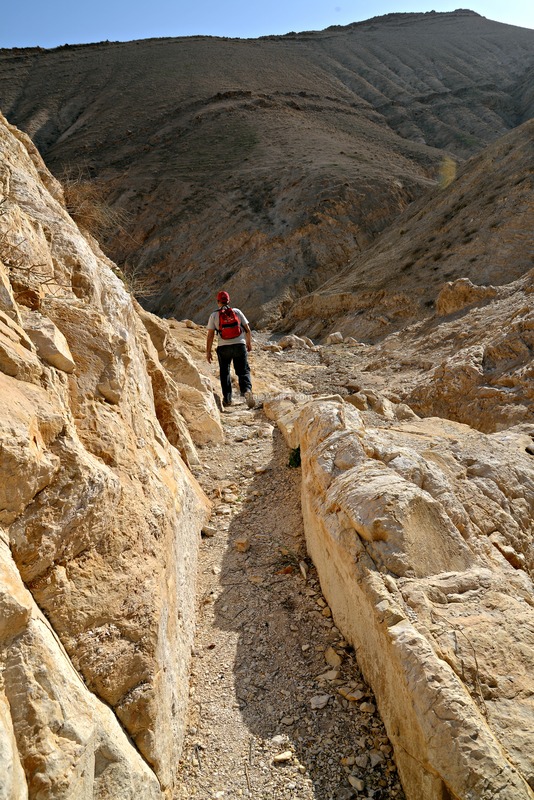 The narrow section of Sekhakha is seen behind the hikers, north of the hill. The entrance to the narrow canyon of the stream is located further west. This point is 200m to the north of the hill of Horkania. 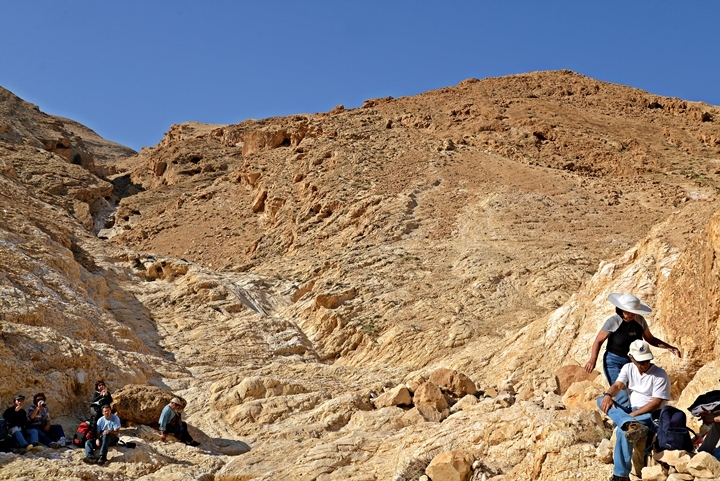 The canyon of Nahal Sekhakha is narrow, and it offers great geological views. Close to the entrance of the canyon are two mysterious tunnels, separated by several hundred meters. The tunnels are cut into the wall, and descend downwards at a sharp angle to a distance of 220m. A view inside of the eastern tunnel is seen in the following picture. It faces north, a total of 62m, with an downward angle of 35 degrees. Stairs are cut into the rock, making it easier to climb up and down. Along the walls are niches for placing oil lamps. At the end of this tunnel the archaeologists found a 1st C BC skeleton of a 26 year old girl with signs of severe sword cuts, and ceramics fragments dated to the second temple period (1st C BC to 1st C AD). It was not a tomb, so the girl might have been dumped there at ancient times. The other tunnel is located 70m to the west, and exactly under the Horkania fortress. Its entrance, which is several meters above the valley floor, is partially sealed with a cement wall. 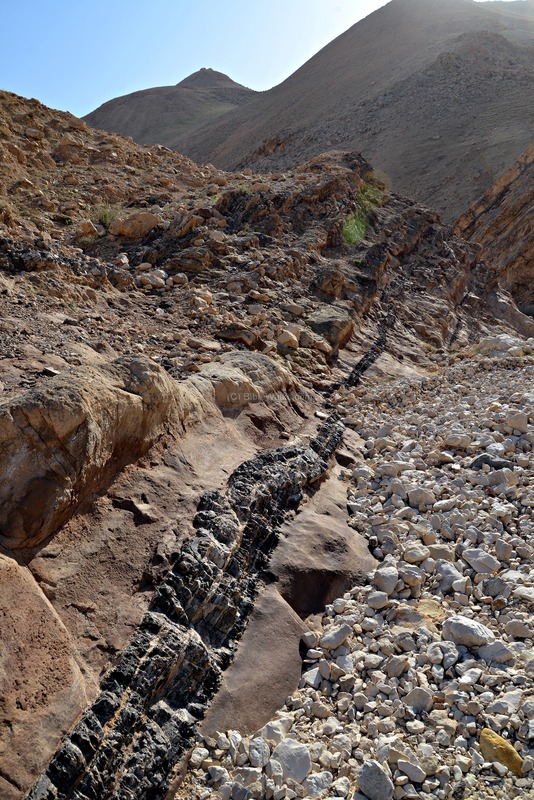 The wall was constructed in order to prevent sediment to fill it up by flash floods during the winter season. Before the beginning of the excavations, and between the seasons, the sediment covered up the tunnel, and the excavators had to repeat the cleaning and removal of the soil. The tunnel's average height is about 2m and 1m wide. It runs on a straight north-south axis, and descends at 56% slope downwards. After 100m from the entrance, the stepped tunnel widens up to 3m and opens up to two tunnels. The western tunnel then continues on the same axis, descends additional 123m after the split. The eastern tunnel descends 53m with an angle of 50 degrees. The excavators hoped to reach to some kind of chamber or shaft, or find the treasures described by the copper scroll. The excavations involved removal of tons of sediment inside the dark and humid tunnel. To their great disappointment, they reached to a dead end on both tunnels. The excavators cleaned the entire tunnels down to the bedrock, and also used special equipment to detect hidden cavities, but found none. Inside the tunnels they found few ceramic fragments, dated to Iron Age II and early Roman period, few Hasmonean coins, a skeleton of a female hyrax (carbon-dated to 590 BC). These findings are inconclusive, as they may have been washed into the tunnel. Oren Gutfeld, who is seen standing in the photo, headed the archaeological excavations of the tunnels (years 2000-2006) and additional surveys in the eastern Horkania valley (years 2006-2008). 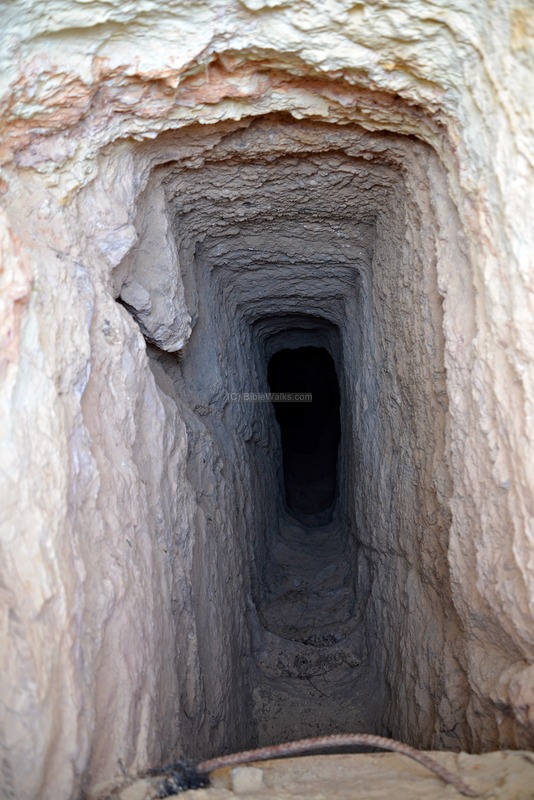 The teams found a total of 4 identical tunnels in the area that start from the wall above the valley's floor, descend downwards on a straight angle (three tunnels are oriented north-south, and one east-west). The archaeologists could not reach to a conclusive solution to the reason they were constructed. Oren speculates that the tunnels were intended to be part of a monumental tomb related to Horkania fortress but was not completed, yet has no solid proof. 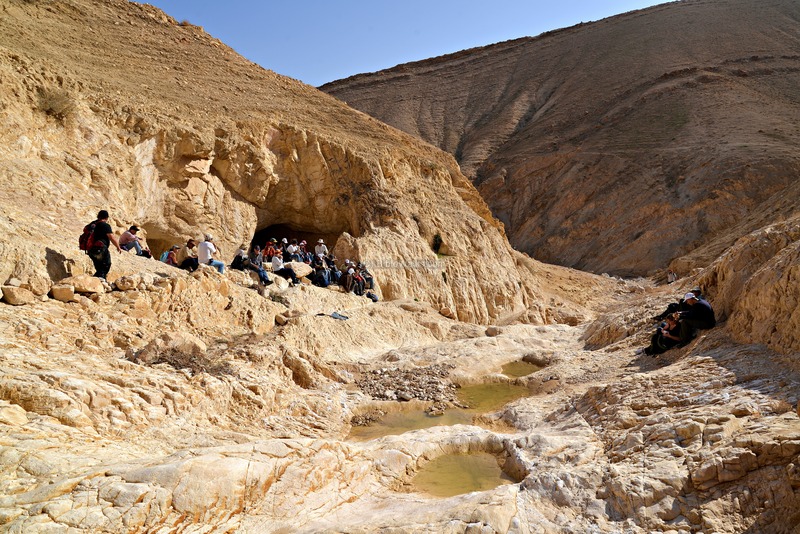 Other scholars raised other theories such as mining tunnels (but no geological sense), hiding places, a penal labor punishment for prisoners, an installation which was part of an Iron Age II water reservoir (for the Biblical settlement of Samra 2km to the east). 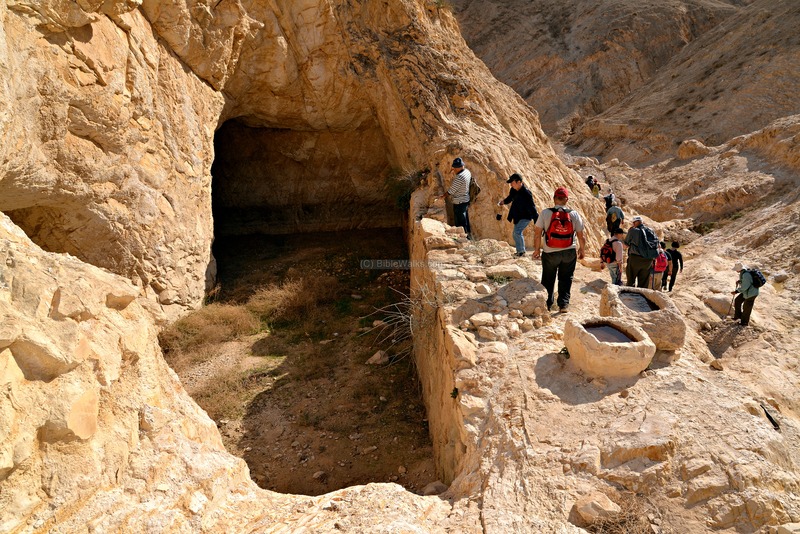 You can listen to Oren's amazing story of the tunnels excavations . 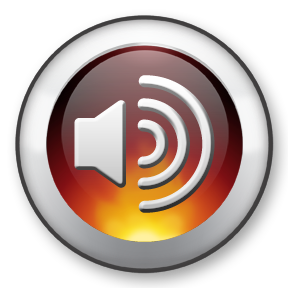 It is a live, uncut, recording in Hebrew, dated Jan 2013. Click here to run it. Further upstream is a dam and water channels that filled up two large rock-hewn pools. The Arabic name of this site was Bir Abu Shualeh. In the PEF survey (p 191) the report was: "A well with water-troughs close to a large cavern cut in the rock north of the well". These reservoirs collected the rainfall during winter time, and then supplied water throughout the year to the Byzantine monks residing in the "cave monastery" (Hebrew: Minzar Ha-Me'arah) , which is located on the ridge to the west. 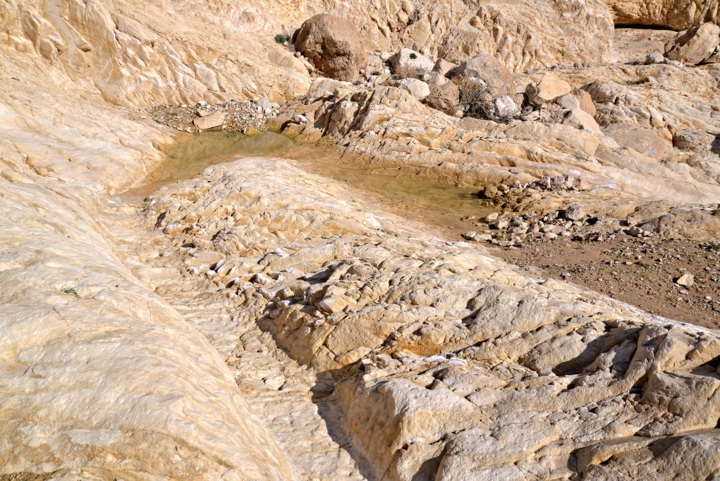 A closer view of the two pools is seen in the next picture. Their size is 12.3m by 15.5m. 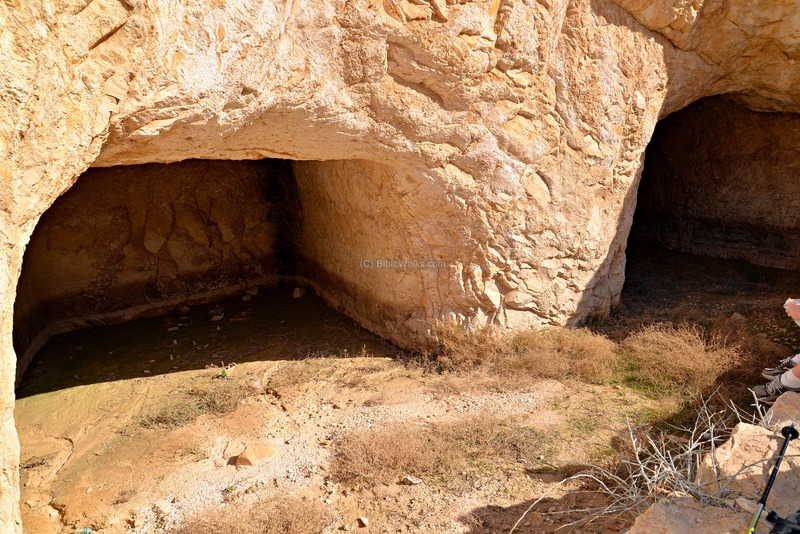 The name "Bir Abu Shualeh" means “well with the cavern”, since the double pools look like a cave. According to the dating of the plaster on the walls, the reservoir is dated to the early Moslem period. Two stone water jars are located on the edge of the reservoirs. The water level in the jars are the result of a rainfall that occurred a few days before, although this area is very dry and rain days are rare. 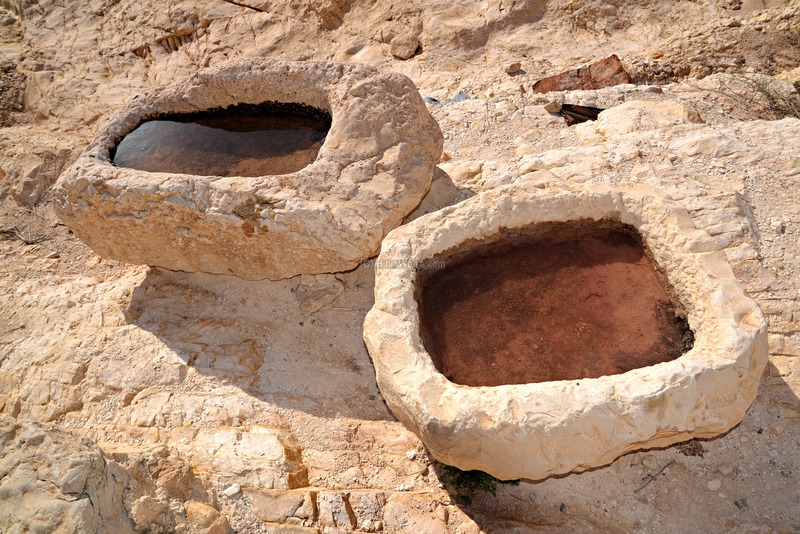 Their original purpose was to be filled from the pools using a bucket. A rock hewn water channel directed the rainfall from the valley on the south to fill up the pools. An aqueduct continued the flow of the excess rainfall water to other reservoirs further downstream. Above the water reservoirs are few remains of the Byzantine "Monastery of the cave", which was founded around the cave on the hill above. The monastery, named "Spelaion" or the "Monastery of the cave", was founded by Sabas around a cave on the northern slope of the valley. Sabas retired to the cave from time to time. In 508 AD the cave was transformed to a chapel, the monastery was constructed on its slope. A wall surrounded it, located 400m to the north of the monastery. This was a form called "Coenobium" (pronounced Coi-Noi-Bee-Yum), which was a communal monastery, where a number of structures were surrounded by a wall and the monks lived there in a commune. The monks lodged inside the compound and also in the caves around it. The archaeological survey identified a dining hall where the monks assembled once a week, sections of its structures and walls. A reconstruction of the monastery, as well as a detailed description, appears in the article referred in the links section. 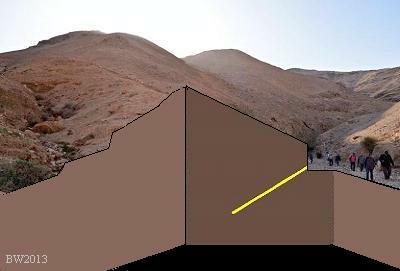 The author concludes (p 447) that "The result looks very much like the present Mar Saba monastery". 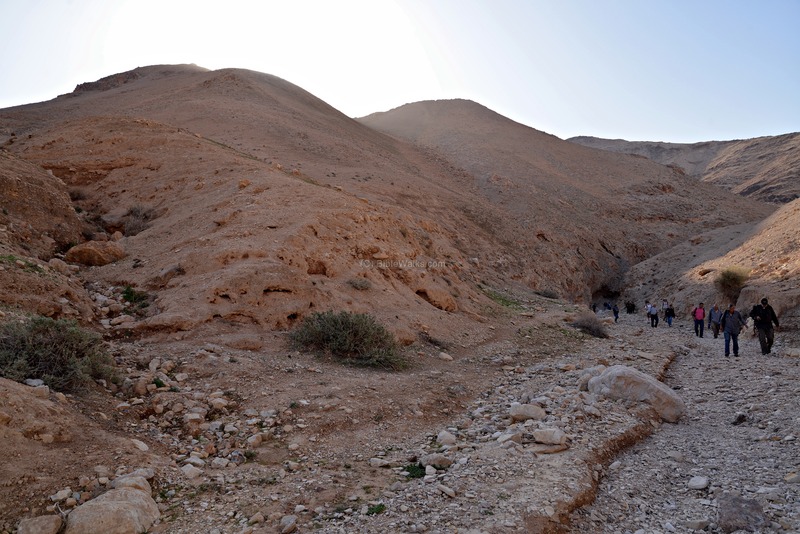 Its history also parallels that of Mar Saba, where the monastery was built on the basis of the cave where Sabas secluded. Sekhakha (Secacah) - an ancient city, referred in the Bible as one of the cities of the tribe of Judah (Joshua 15 20, 61): "This is the inheritance of the tribe of the children of Judah according to their families... In the wilderness, Betharabah, Middin, and Secacah". The name also appears 3 times in the copper scroll. The meaning of the Hebrew name "Sekhakha" is: an open sided shed. Wadi Abu Shu‘la (Shualeh) - the Arabic name of the valley of Nahal Sekhakha.